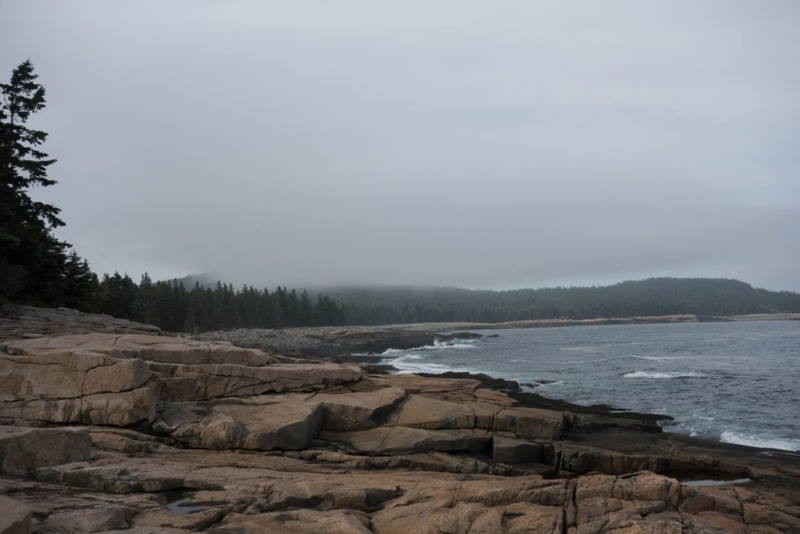 It was our last day in Maine, and we had gone to Schoodic Peninsula to check out the newest addition to Acadia NP. We had already explored the Schoodic Institute and Sundew Trail. Before our trip, we had seen photos of waves crashing onto rocks at Schoodic Point. And a ranger at Schoodic Information Center had recommended hiking up to Schoodic Head, which would be the last hike of our trip. The drive to Schoodic Point from the Schoodic Institute is quick. We parked, and hopped out of the car to see a giant slab of uneven multi-colored rock. The waves were crashing into the rocky shoreline in different places, so we kept our eyes open for a good photo spot. We scrambled around on the huge rock outcropping to capture photos of the waves. Some visitors were getting close to the waves, but we kept a safe distance. There were a decent amount of people around the day we visited. 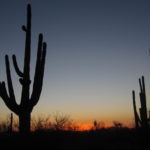 We saw visitors taking photos, exploring the rock formations, and just soaking up some sun. It would also make a nice picnic spot. Schoodic Point was the highlight of my day (although K claims that Schoodic Institute was her favorite part). But despite its uniqueness, we thought that other parts of Acadia were more impressive. 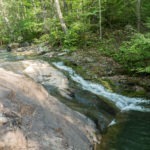 We enjoyed the views and peaceful atmosphere, snapped some photos, and then we were ready for a hike. 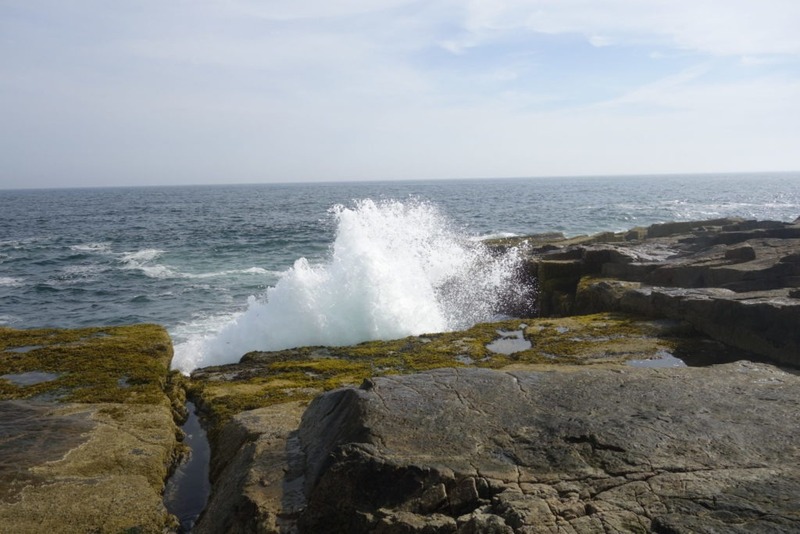 Wave at Schoodic Point – don’t get too close! 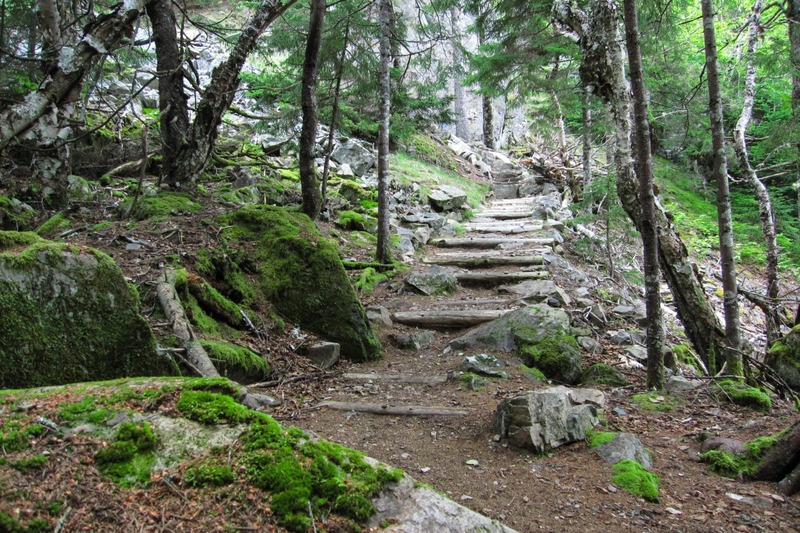 There are quite a few trails in Schoodic, and even a new trail system to reflect the historic character of the carriage roads on Mt. Desert Island. Time was limited, but we wanted to hike one more trail, since it was our last day in Acadia. So we choose a 2.6 mile loop up to Schoodic Head. 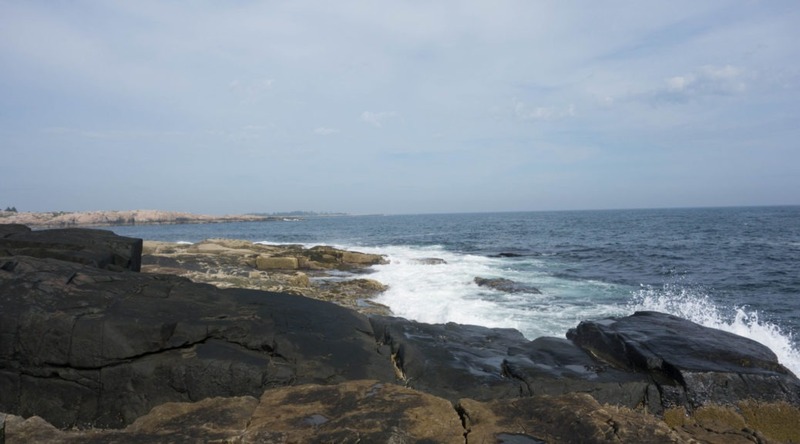 Schoodic Head is only at an elevation of 440 feet, so it’s not a particularly hard hike. We drove from Schoodic Point over to the parking lot at Blueberry Hill. Once done with the Anvil Trail, we were pretty much at the top, and it was only a short distance on the Schoodic Head Trail to the summit. There are good views, but we had to search for them, as much of the summit is forested. After getting some photos we headed back the way we came on Schoodic Head Trail, then continued on past the Anvil Trail. 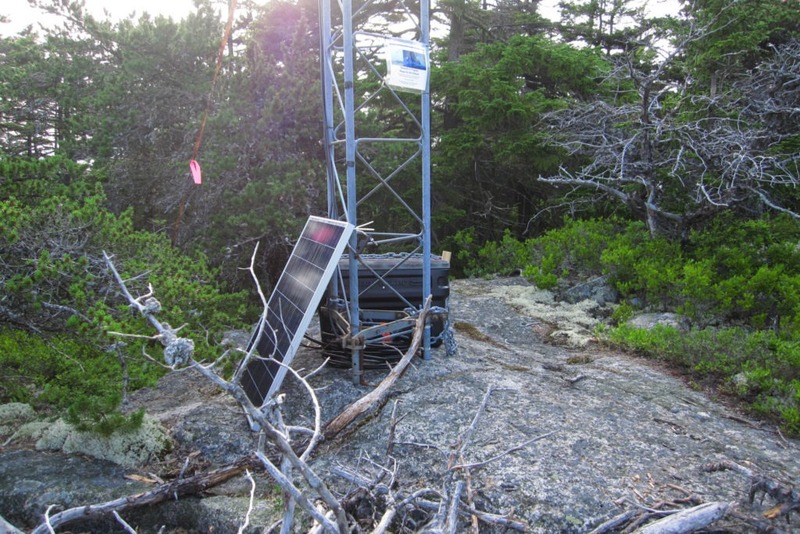 Near the summit we saw a research station for studying bats. We were curious, as we’ve seen similar things in other parks, but there was limited information. The Schoodic Head Trail continued south for another 0.5 miles. The Schoodic Head Trail deposited us onto a dirt road. In a tenth of a mile or so, the road disappeared, and we were on the Alder Trail. It’s a fairly uninteresting trail that led us back 0.6 miles to the Blueberry Hill Parking lot. 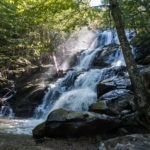 While the loop trail was a nice walk, it didn’t compare to the trails we hiked in other parts of the park. Since it was our last experience in Acadia, it was a bit of a letdown. But before driving back to Bangor, we decided to grab dinner in Winter Harbor, the closest town to Schoodic Peninsula. Winter Harbor is a small town, with limited restaurants and attractions. We were divided between two restaurants that we found: Raven’s Nest and Fisherman’s Galley. Ultimately, we chose Fisherman’s Galley. We think it ended up being a good choice. 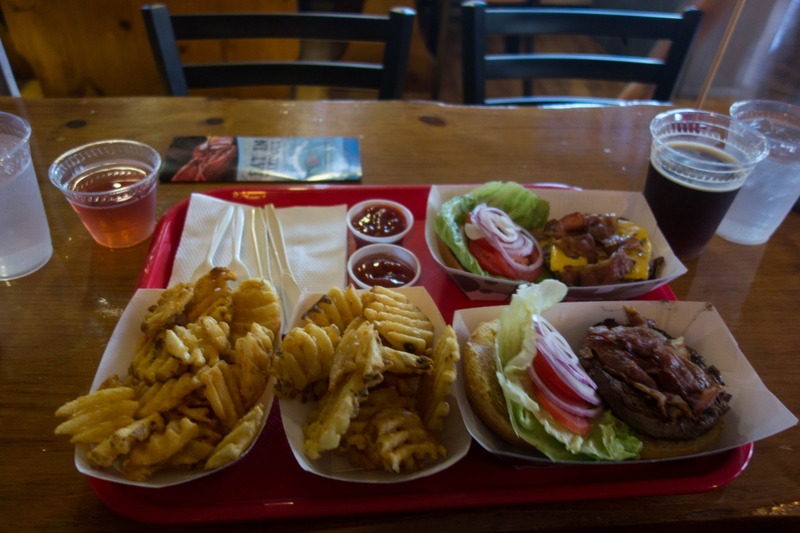 The burger, fries, and beer (or wine for K) was exactly what we needed. They have the usual lobster rolls too, but somewhat regrettably, we didn’t try them. We discussed our day as we ate. The consensus was that Schoodic is unique and worth the visit if you have time, but we’d recommend MDI and Duck Harbor more highly. 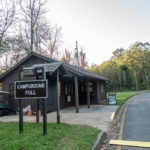 However, we wished we had more time to explore Schoodic, particularly the carriage roads, campground, and other trails. The highlights were the Schoodic Research Institute and Schoodic Point, so that’s what we recommend if you have limited time. And with that, our vacation was over. We had already loaded up our car, so we headed down the road to Bangor, where we would fly home the next day. As we drove, we chatted about our trip and decided that we would definitely revisit Acadia someday. Water: Oceans, but we didn’t see any type of fresh water. Mile 0.0 – From the Blueberry Hill Parking lot, walk north on the road for about 0.1 miles until you reach the Anvil Trailhead on the left side. Mile 0.1 – Ascend the Anvil Trail. Mile 0.4 – You’ve reached “the anvil,” a rock outcropping. Continue hiking up. 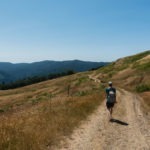 Mile 1.2 – This area is a bit confusing, with multiple intersecting trails. Continue north toward Schoodic Head along the Schoodic Head Trail. Mile 1.3 – You’ve reached Schoodic Head at 440 ft, so take in the views, and then head back the way you came on Schoodic Head Trail. 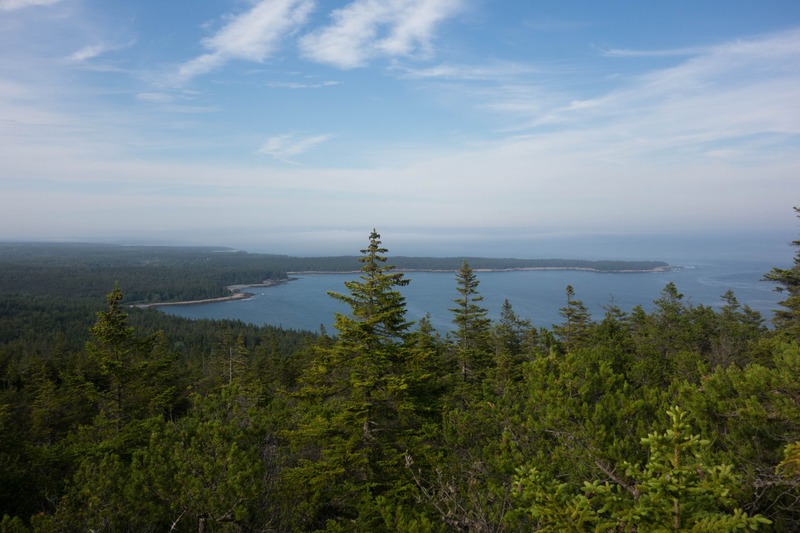 Mile 1.4 – When you get to the intersection with the Anvil Trail, continue on Schoodic Head Trail. 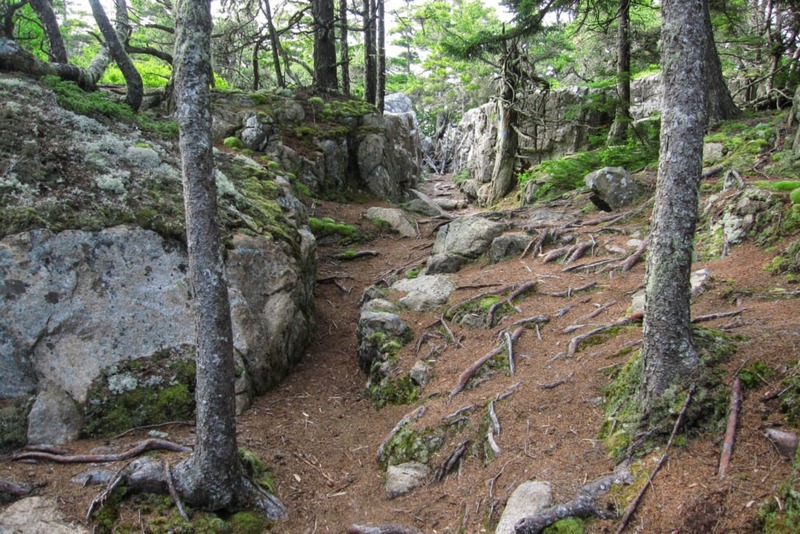 Mile 1.9 – Schoodic Head Trail ends, and deposits you onto a dirt “road” called Ranger Cabin Road. Head south, or left as you turn off the Schoodic Head Trail. After a short while, connect onto the Alder Trail. Mile 2.6 – The Alder trail ends at the road, at Blueberry Hill Parking Lot, completing the loop. Notes: The attached map and elevation below specifies the hike as a 2.5 mile because it excludes the starting portion on the road.